Heck, shift key scaling is the standard since GUIs came along. I remember using it for MacPaint back in the 1980s. It's muscle memory and should be an option. PLUS when you are trying to stretch an image such as a shadow and forget to use the shift keys while doing it, the image doesn't stretch in one direction. So enraging! It's kind of like unilaterally deciding that the shortcuts for Cut and Paste are too old school to be cool. I concur. I don't mind adding more options for things but please allow us to turn the new options on or off in the preferences. As someone who heavily uses right-click to select layers, this is VERY problematic when you select text layers to move them. Agreed. Adding features is one thing. Editing the functionality of the tool(s) is another. Especially when it compromises a users work flow. Agreed - and you know what? Old habits are hard to break, especially when you've been a PS user for so long! It's like it's not cool to be old school! Disappointing really. 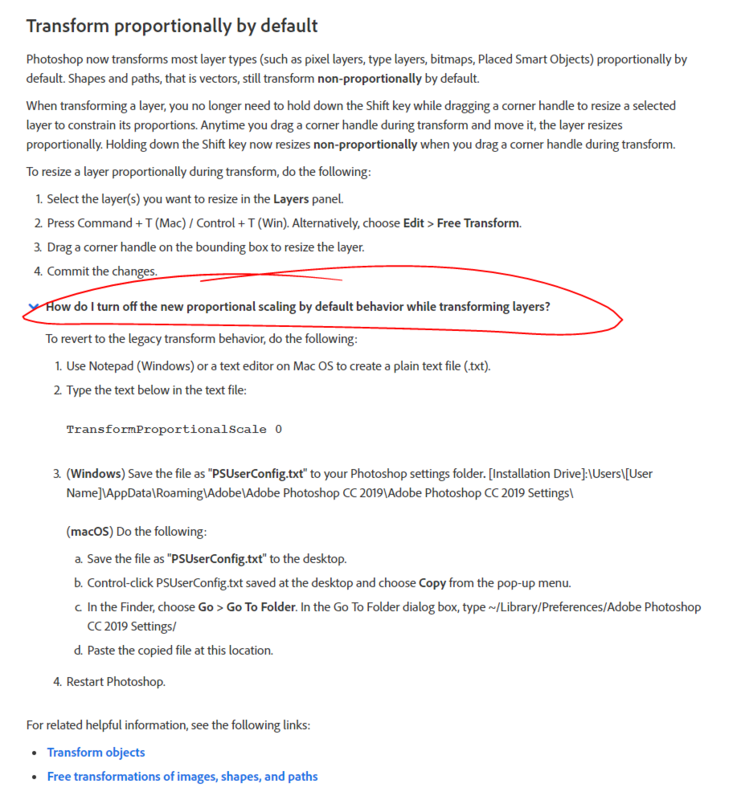 This reply was created from a merged topic originally titled Photoshop CC 2019: Ability to turn off "Auto-Commit" click when transforming. YES! I am already SO annoyed that almost every time I go to move some text it wants to edit it. Maybe I'm click happy, but I've never had this issue before and I absolutely hate it. Agree. It's hard when you've been using PS for years to break a habit like this. I really think Adobe should be mindful and respectful of their long term customers. I don't know Adobe. . . but something is not working. Do you not have beta testers before releasing a new version? I feel like we are ants some kids play with. @Rosa I'm still trying to retrain my brain not to hit option+shift when wanting to resize proportionally. Bennett totally understand. I tried to work with the tool also and wanting to adapt to change, but I was getting weird responses when using distort. . so went and sussed out the constrain link on the toolbar and it doesn't work. Nil response. So over these new releases. I'd rather see a new release of Adobe products less frequently and only after they've been through rigorous testing. I accidentally keep editing my text layers. I have auto select group/layer turned off. I use CMD + click to select a text layer. When I select the layer and try to move it, I keep accidentally opening the edit mode. This happens because CMD + click combined by the click + hold to move, is registered as a double click. The solution to click slower, or turn on auto select isn't working for me. Double click to edit seems like a nice feature, but its a real pain when you're not using auto select. I have the same issue. My workflow is seriously impeded by these new features. Don't get me wrong, they're nice for beginners or casual users who are used to WYSIWYG, I suppose - however not for those of use who have been working with Photoshop for over 15 years and are used to working at a crazy speed to save the day in the editorial. I'm glad I was able to restore the suddenly vanished anchor point of my bounding box selections in the preferences and found a way to get rid of the new fixed ratio resize feature by googling for help (and overriding the program settings via additional .txt file). Perhaps these new features would be better implemented in this new skim version of Photoshop instead - Photoshop Express - or at least consider making them optional. Click me-too to make them think seriously before another such changes while making this one easier to quickly toggle, by just one click when someone doesn't like it. Yes - Please add the ability to disable the auto-commit function (as well as all the new functions). I've been using this program for over a decade and my workflow became substantially impeded with these small changes. Auto-commit for transform is REALLY annoying. And you can't undo it, so if you accidentally click the wrong place, you have to start over. Definitely wish we could choose to turn this off. It's so frustrating when they force changes that just annoy their users, and don't even make it optional, but mandatory. As well as sending out e-mails asking what we feel needs improving / changing and then ignoring us. This is rather ridiculous actually. Now every time i make any small change i have to exit out of the text editing window because i don't keep on auto select. i command + click an object. They have the ability to revert back to hold shift and scale but this is more annoying to me and no solution. This change has me seriously ready to bang my head against the keyboard... I work on projects with a lot of text layers and I am constantly having to "move very slowly" or escape after trying to move text or (the best) when I go to move text, it goes into edit mode instead... Seriously, whoever thought this was a good idea, really needs to move to another part of the development team. +1 for please making this an option to turn on and off. Even if not in preferences, at least through some text file hack like there is to revert to shift constrains proportions. (put a .txt file named PSUserConfig.txt that says "TransformProportionalScale 0" for those who haven't found it). If there was something like that to turn off various new weird tweaks so that these programs worked for, not against, us it would be a lifesaver. We shouldn't have to use text file hacks or codes to revert to previous behaviour. Adobe why aren't you listening to us? Please get your engineers back onto the desktop app and hire app engineers to concentrate on the iPad Photoshop 2019 app. Keep the two separate and not make Photoshop work the same on desktop and same for future iPad app. Because I think that's what's happening. Having the option to choose tool behavior is a must. I really don't understand how could they think it is a good idea to force users this way. This is insane. Please allow toggle to turn off new features that were made for newbies. Double clicking text and holding shift to scale are the big offenders. The whole thing is soo broken. Now how am I going to scale something on one axis, while not getting snapped? Usually I could press CTRL - and SHIFT but now that doesn't work anymore, as it unlocks the other axis also. The user experience is worse too now, since I can't just transform anymore quicly - I have to triple check for every fricking click, so that I'm not accidentally applying the transformation, because only certain areas let me transform (and that doesn't get reverted with the TXT setting). Please, don't just fix it: Remove this change and fire the employee who came up with it and whoever approved this. Returning to the 2018 version is the only solution I have found. I haven't tried the updated PS 2019. Is the constrain link fixed on the tool bar RF ? I can't bring myself to open 2019. You mean shift to constrain? Nope. I'd hoped that they had seen sense. But apparently not. The constrain button in the tool options bar. It's being ignored when unchecked in the new default constrained mode. It doesn't matter whether you check the chain link or un-check the chain link nothing happens. It hasn't been fixed. I just updated and checked.